Private carrier Vistara and Japan Airlines(JAL) on Thursday signed a Memorandum of Understanding (MoU) to jointly explore commercial opportunities, including code sharing of flights. 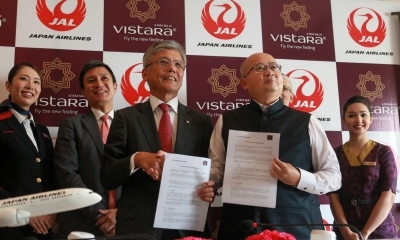 “This mutual understanding between Japan Airlines and Vistara will help the two airlines pursue significant cooperation in the near future such as codeshare, frequent flyer partnership as well as other operational arrangements, allowing them to leverage each other’s network, expertise and assets, subject to necessary approvals from authorities,” a joint Vistara-JAL release said. JAL Executive Vice President Tadashi Fujita said the latest agreement of “conditional or limited cooperation” besides providing for code share and frequent flyer partnership would also have facilities like airport lounge access to give a seamless flying experience and better service quality to the customers. Vistara CEO Phee Teik Yeoh noted the agreement with JAL comes at an opportune moment with India and Japan set to ratify the open-sky agreement later this month during Japanese Prime Minister Shinzo Abe’s official visit to India. 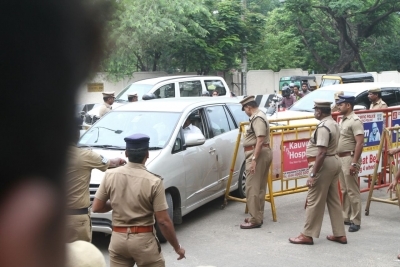 An MoU in this regard was signed here last week. The open-sky agreement between the two countries allows airlines from both sides to operate any number of flights to each other’s cities. Vistara is poised to begin flying to international destinations soon and is awaiting the necessary permission, Yeoh said, adding the current fleet of 16 aircrafts would expand to 20 by March 2018. The private carrier would start services to Ranchi, Jharkhand, from October 29 this year, making this the 21st domestic destination for Vistara – a joint venture of Tata Sons and Singapore Airlines.